At the end of 2017 we were approached by Chris Woods on behalf of the Keith Black Will Trust who wanted to donate his Colvic Countess 33 to Sail 4 Cancer. After considering whether to use her for our family sailing days it was eventually decided that the charity would get more benefit is she was sold and the funds used to give breaks to the many families on the waiting list. Sail 4 Cancer contacted Ian Sawkins from Boatshed Scotland who agreed to market and sell her. On a cold winter’s day Sail 4 Cancer met Ian and Chris to take ownership of Sealord at Tarbet on Loch Fyne in Scotland. It was clear that she was a much-loved boat and that the new owners would be lucky to have her. The Colvic Countess 33's are renowned for their large beam and spacious living space and Sealord has seven berths in two cabins making her a perfect option for family sailing. Sail 4 Cancer became the official owners of Sealord a week later and took care of all the insurance and mooring fees from then on, plus also took care of some small repairs on the boat and sails. 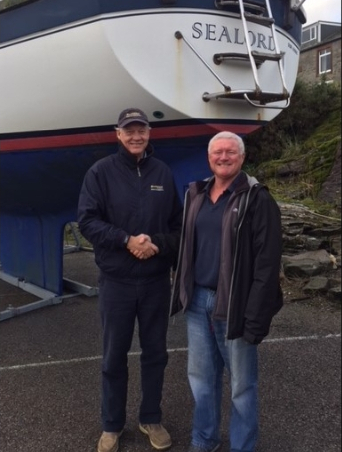 Ian from Boatshed Scotland recorded over 350 pieces of information including over 100 photographs, full boat spec, and started advertising the boat on Boatshed, within a few months an offer was on the table from a couple from Skye who proceeded to buy Sealord. Boatshed Scotland took care of took care of all the paperwork for the original owners, the charity and the Buyers and supported everybody throughout the process throughout the boat sale process. The proceeds from the sale of Sealord enabled us to support 10 families to have a break from cancer. By donating your boat toSail 4 Cancer, you will be helping families affected by cancer get away from the stress for a much-needed break. If possible we will use the boat for our sailing programme but if we are unable to do so due to location and insurance limitations, we ask our partners at Boatshed to sell the boat to raise funds to support more families on our waiting list. If the mutual decision is taken to sell the boat there are two options on how to proceed. Owners can keep possession of their boats and we arrange for the local Boatshed brokers to sell the boat and the funds are then donated to the charity after the sale OR Sail 4 Cancer takes ownership of the boat and the associated costs including mooring and insurance fees. This is particularly helpful for people who are facing escalating maintenance costs or where monthly mooring or storage costs are becoming a burden. Once accepted for the scheme, any debts owed against the vessel will be paid off from the final selling price. To maximise the value of the donation, brokerage fees are waived or kept to an absolute minimum. If small repairs are required to increase the value of the boat the charity will take care of that too.